I can't believe the day is already upon us. I am a ball of nerves and wish I could just sleep through the next few days. Alexis and I arrived at Nationwide Childrens Hospital today around noon (as we were told). Of course, I should have expected there to be problems since the surgical cordinator has been less than helpful putting this whole thing together (I didnt get ahold of her until after 4 pm yesterday..and she finally informed me that I needed to be here today) The admitting department had no idea we were coming in today. After several calls, and waiting nearly a half an hour, we were finally in the system to be taken to our room.. but, of course our room wasnt ready (insert very ANNOYED face here!) so after waiting another half an hour.. we were finally ready and were sent off to our room. Which, I almost forgot to mention-- we are in the new hospital at NCH! SO nice..huge..and modern! Our rooms are bigger than a walk in closet and they are equipped with a nice 40 in lcd and a wall that even changes colors continuously! Its luxury at its finest when compared to the old hospital and the old rooms! 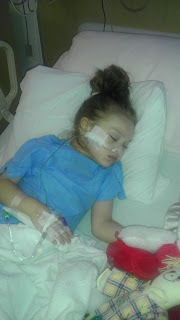 The previous portion of my blog was written before all the "fun" stuff started happening..
About 2 hours after getting to our rooms, the nurses decided it was time for the NG tube (small tube they stick down her nose, down her throat and into her belly). Horrible. All Alexis has done since getting it placed is cry, choke and attempt to make herself sick. The only relief she manages is sucking on a popsicle. It hurts so bad watching her deal with something so SMALL, knowing I am about to change her world tomorrow. Just thinking about it at this point makes me so mad and angry. They brought in a gallon jug of some type of medication that they are feeding through this tube which is meant to clean her out. As soon as everything is clear, the tube comes out. We met with the ostomy nurses, who marked on her belly where the stoma will be placed. Watching them talk to her and explain what they were doing was exceptionally hard. I have done nothing but try and prepare BOTH of us for whats coming, but visualizing it was unbearable! Something so simple, yet I barely made it through without breaking down. They did get Alexis a shadow buddy doll-- which she seems to really enjoy, so that was a plus. I probly wont write again for another day or so. It took everything in me to get this out, but I knew if I didnt all of my emotions would be jumbled up into surgery day and I would most likely forget everything. If you want to send Alexis a card, click here. All you have to do is enter in her room # (H05A-15) and they will print it out and deliver it to her! There are no visitor restrictions, however I know she will be in alot of pain tomorrow and wont be up for much company (besides immediate family) anytime after that is completely fine!